Being Mobile World Congress and all, one would fathom smartphone manufacturer Huawei to wow attendees at its press conference with some brand spanking new, next-generation smartphone of some sort. However, as the event continued on, it became quite apparent that was not going to be the case. Instead, they opted to debut some cool accessories. 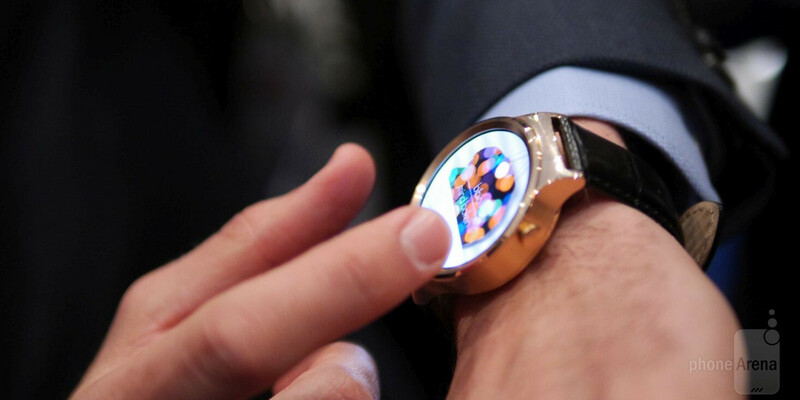 Out of the entire bunch, the Android Wear powered Huawei Watch received the most attention and adulation from the crowd – more so when it’s sporting an elegant looking watch design. Looking at the renders and all of the photos being displayed at Huawei’s press conference, we were extremely excited to check out the Huawei Watch in the flesh. From the first moment we checked it out, we can’t help but to draw comparisons to the Moto 360, seeing that it follows the round clock face style – as opposed to the square ones used by others. True, the Huawei Watch itself is considerably more compact and doesn’t seem like a beast on your wrist, but we were hoping for something with more substance behind it. Scoping out the various models being shown off, it’s undeniably wonderful that it’s offered in three distinct colors – gold, silver, and black. One person was wearing the gold colored versions of the Huawei Watch, with the accompanying gold band as well, which we have to admit looks pretty premium and elegant. However, after playing around with the black colored version, which just like the gold one, is constructed from forged out stainless steel, it lacked enough weight and substance to give it a sturdy feel. As for the display, we’ll give Huawei props for delivering a class-leading resolution – a 1.4-inch 400 x 400 AMOLED display. Naturally, we can’t complain about its looks under artificial lighting, where it exudes all the qualities of AMOLED technology, but we’re curious to know its visibility outdoors with the sun present. Under the hood, it’s stuffed with a Qualcomm Snapdragon 400 chip, 512MB of RAM, heart rate sensor, barometer, and many more sensors. Don’t get us wrong, it looks pretty good when you’re just looking at it, but the feel of the material just doesn’t sit with us – it’s almost on the cheap side, despite the “premium” look of it. So far, there’s no word on pricing or an exact release date, but it’s slated for release sometime as early as mid-2015. Pricing, obviously, will dictate whether or not it’ll be justified to pick up over other new offerings that were recently announced – such as the LG Watch Urbane. Why does everyone keep glancing over How thick it is? It looks far thicker than my moto 360 which I already believe is too thick as it is. Why does he keep saying it looks like the moto 360? It looks like a G watch R without the paint or the Urbane. Its because this and Moto 360 have no bezels. Both the LG G Watch R and LG Urbane have more of a bezel. Also the Moto 360 and this watch are 42mm.